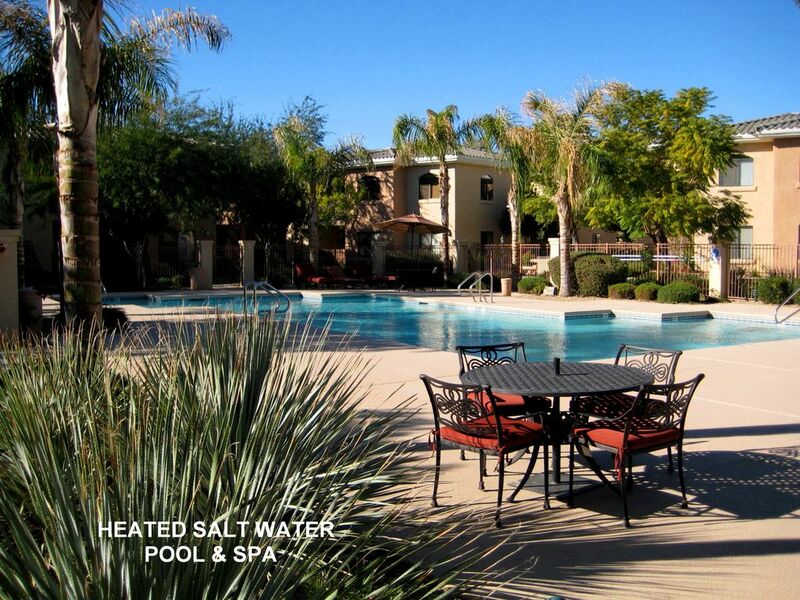 Quality Gated Community in West Phoenix / Avondale area - This very tastefully furnished upscale condo is waiting for you at the cool Desert Breeze Condominiums. Really great location close to lots of golf, many major sports venues, tons of good restaurants, exciting night life, shopping and tourist destinations. This is a fully equipped unit, all you need to bring are your golf clubs and a bathing suit. We even have a couple of bikes for you to ride, some pool toys, pool towels and even the ice chest tso you can relax at the pool with all the necessities. Arizona born & raised original Zonie. Comfy Quite Condo in Great Location. The Condo is just a few steps from the Heated Salt Water Pool, Hot Tub and 24 hr. Fitness Center. Gas BBQ are available outside your condo for your convenience. 42" HDTV with Cable TV and Wi-Fi Internet access and even a line-line. Couch pulls out to make 2nd full bed. All the linens, towels, dishes and kitchen equipment are furnished for you. The condo unit was good, included full kitchen, washer, dryer, there was a patio. Unit was fully furnished including dishes and silverware. it was clean and convenient to fitness center and pool. This was a gated community which was well maintained and filled with friendly people. WE rented the condo for the month of January, and had a fabulous time!!! Dene (property Manager) was most helpful and clear in explanations, and absolutely immediately responsive to the few requests we made of him. The unit has covered parking, and the spa and pool are great!! plus the other guests were mostly Canadian and we enjoyed the 'international' interaction each evening soaking out the kinks.... the accommodations were as advertised, the bed quite comfortable, great closet space, and the unit overall was quiet. we like the layout of the unit, seemed very spacious and open for a 1BR. seems like many of the units are rentals, with nice upscale folks whose travels and stories are most interesting. We spent considerable time in Pebble Creek, and golfed around the city, the location and proximity to I10 and the 101 made getting around Phoenix very easy. Do avoid the rush hours! Kitchen had all we needed and we were set to go after one trip to Costco (less than 10 minutes) and the local grocery store, Fry's. Grilling out in the common area is great, excellent grills, and again the international company and folks were open to sharing the grill, so no wait time good company while the meat's cooked. We were tempted with the bikes, and looked them over, they are sturdy models and well equipped, but didn't find time for a ride. Our stay at the condo during our recent visit to Phoenix was excellent. The condo is well laid out beautifully decorated and well maintained. So much better than a hotel. We really appreciated the pool and hot tub and used the workout centre every day. The bounds at the complex are beautiful and well maintained. There were so many friendly people from a number of places. It was great meet new friends. The location is great near everything we wanted to do and see. Our recent stay at your condo was just fabulous and definitely beats a hotel stay. The short, 20 minute commute from Phoenix airport allowed us extra time to enjoy our stay. The condo is simply a delight, with plenty of room for a family of 5. I especially liked the convenience of the grocery store being walking distance as well as several restaurants and Starbucks. I enjoyed the immaculate landscaping with lots of gorgeous flowers by the pool/workout room area, both of which we used daily. I am looking to book the condo again over spring break with the entire family and will contact you shortly with the dates in mind. I can just imagine the kids asking to go to Sonic next door every day. Thank you again for a very memorable stay and I look forward to another. Thanks for posting your comments Brigitte. It is a very nice condo. We would love to have you back next spring break. The Condo is 5 minutes from: the University of Phoenix Stadium, Glendale Spring Training Complex, Peoria Sports Complex, Phoenix Coyotes Hockey Stadium, Westgate Center and the Tangers Outlet Mall. 24 minutes from Sky Harbor International Airport, 17 minutes to Phoenix International Raceway. 15 minutes to the World Wildlife Zoo & Aquarium. This condo is conveniently located to everything! Phoenix has more golf courses than you can shake a golf stick at!!! Tons of great restaurants and shopping near by. Hiking trails in the White Tanks Regional Park is only 25 minutes away. A 45 minute drive away you can be skiing at Lake Pleasant. One hour drive to senic Sedona, in 2 1/2 hours you can be skiing in Flagstaff.